It’s time to take a look at the Legend of Kay Anniversary game. I never really knew about the original Legend of Kay, but I suppose it had to at least be moderately popular in order to get a remake like this. It’s essentially the Legend of Zelda, but with a weaker plot/main character. It’s a fun enough game, but odd level designs and the story are probably why it never became all that popular. Still, it’s a fairly fun game that is worth your time. The plot follows a kid tiger named Kay. Unfortunately, Gorillas and Rats have teamed up to take over the world so not even his village is safe from this. He quickly decides to liberate the village and this way Kay can show off his warrior abilities as well. In order to stop them, he will have to defeat the commanders and also assemble the legendary Cat statues in order to proceed to the villain base. Lots of other animals have also been captured so Kay will try to save them all on the way. As I’ve already stressed, the plot isn’t all that interesting. It’s probably because the villains are rather inspired. Neither the rat nor the gorilla seem to be much of a threat if we’re being honest and the supporting cast is basically nonexistent. As such, it’s all up to the main character and the heroine. Kay talks really tough and does have a fun personality so I’d definitely say that he is a very solid main character. The villains talk smack all of the time so why not have the main character respond to it for a change right? Well, Kay can certainly dish it out just as well as the rest of them. The heroine is also one of those characters who talks really tough. It’s a little less deserved as she doesn’t actually do any real fighting, but it’s better to talk tough than not to do so I suppose. The romance is fairly weak though. The two characters keep cutting each other off and it pretty much comes out of nowhere. Why couldn’t they just be friends? I think that’s always more of an admirable goal from the game’s view as it defies expectations and even shows restraint on the game’s part. All right, with the plot and characters out of the way let us look at the most important part of the title. The gameplay. It’s a fairly standard 3D platformer. You wield a sword, hammer, and claws as you fight your way through enemies. The sword is the most fun to use, but the claws are the quickest weapon and the one that you’ll want to use to overwhelm smaller enemies. The hammer is great for when you’re outnumbered thanks to its wide range and great attack power. You’ll be able to upgrade these weapons as you progress through the game. You can also shoot a blast of thunder by charging up an attack although it’ll cost you some magic meter. The combat here is very fun and it can also be quite challenging. You’ll definitely have to utilize some strategy here as opposed to just rushing straight at the enemies. Most of the bosses are fairly easy, but the final boss can be difficult. He has 2 phases and while you may have the edge in health, if he knocks you off of the tower you lose a life and respawn without any items that you may have used. It can get pretty dangerous as you can arrive at the fight filled with potions and armor and then have to start the fight without any of that if you fall. It’s high stakes and I managed to beat him on my 3rd try on my final health point. It’s always nice and dramatic when that happens. Basically, that’s when I activate my Ultra Instinct. The platforming is a little weaker. Basic jumps can be a little difficult because of the camera angles. It’s hard to adjust the camera and it simply can’t keep up. While the game has a map, it’s not very good and you can actually get lost and not know what to do. That happened to me for quite a while in the fire level. Toning down some of the puzzles within the levels and making the routes a little more straight forward would certainly go a long way. It certainly could have been far worse though. There isn’t much replay value to be found here as once you fight the final boss you can’t go back. You’ll just have to start a new file if you want to do anything else. Aiming for the platinum trophy is the only reason to keep on playing the game and to get that one you will need to complete the game on Nightmare difficulty. That should certainly be a real challenge so good luck on that one. Still, the base game is long enough where you can still justify the price in the end. It’s a good amount of content. The graphics look pretty good. The fire effects in particular are pretty nice. Unfortunately most of the big cutscenes are story book style which is still one of my least favorite formats. There just isn’t much that you can do with it and there’s no real animation there so it’s like the game is taking the easy way out. At least the cutscenes during the gameplay are animated normally and have voice acting so that was certainly nice. Part of the fun throughout the game is Kay’s banter which works a lot better when you can hear what he is saying. As for the soundtrack, it’s a little limited, but certainly doesn’t sound bad. You’ll definitely recognize the danger theme after a while since it plays so often. It’s not the most memorable soundtrack, but it’ll get the job done. Overall, The Legend of Kay is a good game. It’s not a great one by any means and you can tell that the developers were still finding their stride as far as platformers go, but it’s still good enough where I can recommend it. Just play the game for the gameplay as opposed to the story and you’ll be good. Truth be told, you should always be playing for the gameplay anyway so it’s not as if this should be anything new. I’d be up for a sequel coming out one day. There’s more they can do with Kay as a character and I’m always up for more action platformers. Maybe the enemies in a sequel could be wolves, those guys are threatening. 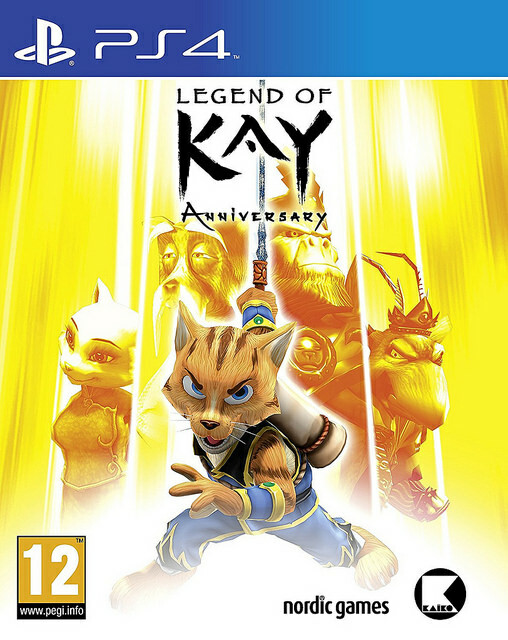 This entry was posted in 7 Star Games, Game Reviews, Games, Reviews and tagged Adventure, Game Review, HD, Legend of Kay, Legend of Kay Anniversary, Platformer, PS4, Remake, Review, Video Game Review by dreager1. Bookmark the permalink.